British Columbia's Big White Ski Resort. While it doesn't feel like one of the largest ski areas in Washington, with its quaint village feeling and family friendly vibes, 49 Degrees North is just that, with 2,325 skiable acres. The terrain is spread out with a perfect mix of challenging glades, immaculate groomers and two mountain peaks — Chewelah Peak and Angel Peak — to challenge any level of skier or snowboarder. Additionally, there are 10 miles of Nordic trails available to get the heart rate elevated. Back in the village, there's a lively atmosphere at the Boomtown Bar, the quintessential ski bar. A hidden gem, located in the northeastern corner of Oregon — the dry, sunny part — Anthony Lakes receives an average of 300 inches of light and dry snow. The ski area is 1,100 acres, with a nice mix of terrain for all abilities. Anthony Lakes boasts a high base elevation of 7,100 feet of above sea level, and a summit elevation of 8,000 feet. Lodging is available nearby in the towns of La Grande and Baker City. Located just 30 minutes from Penticton in south-central B.C., Apex Mountain Resort is the perfect mix for an epic adventure. With low temperatures and humidity, lots of precipitation — an average of 20 feet annually — and a great location in the heart of the Okanogan Valley, this is Canadian skiing at its finest. Champagne powder, spread out over 1,112 skiable acres, blankets groomers and steeps at one of the last hidden gems north of the border. The only ways to describe Big Sky Resort are "massive" and "endless." Aptly named, the resort boasts 5,800 skiable acres — the most in North America — 23 chairlifts, 11 surface lifts, seven terrain parks and an incredible average of 400 inches of snow annually. Not to be outdone, back in the village area, the sheer volume of amenities makes it feel like its own town, with a wide array of après-ski, dining, retail and lodging options. Big White Ski Resort can best be described as big fun for the entire family. On the mountain, there are 2,765 acres of skiable terrain to explore, with 15 lifts to get skiers and snowboarders to all of their favorite stashes. Off the mountain, there are endless options for après-ski activities, including ice climbing, snowmobiling and ice skating, as well as more than 20 eating and drinking establishments. Getting to Big White is easy; it's located just 35 miles from Kelowna. Everyone starts at the top at Blacktail Mountain Ski Area. The unique format, also known as an upside-down mountain, sees all skiers and snowboarders starting at the top and going down to the bottom before ever loading a chairlift. The ski area offers sweeping views of Flathead Lake and Glacier National Park in the distance. This quaint ski area offers 1,000 skiable acres, with the longest run being 1.75 miles. Lodging is available in nearby Lakeside, or a little farther north in Kalispell. Lake Louise is the biggest resort in the Canadian Rockies. The mountains that surround Bluewood rise out of the high desert, offering premium conditions — light, dry snow, low temperatures and blue skies. The ski area is 54 miles northeast of Walla Walla, near Dayton. Bluewood receives an average of 300 inches of snowfall annually and boasts some of the region's best tree skiing. Bridger Bowl Ski Area is Montana skiing at its best, with 350 inches of annual cold smoke snowfall — light, fluffy and lots of it. Located only 20 minutes from Bozeman, a vibrant college town, Bridger offers a top elevation of 8,800 feet, with challenging steeps, chutes and bumps, in addition to some new beginner areas for this season. The mountain is unusual in that as elevation rises, so does the skill level for that terrain. Back in the village, there are multiple options for eating and après-ski libations that provide the feel of being in a true ski-bar environment. 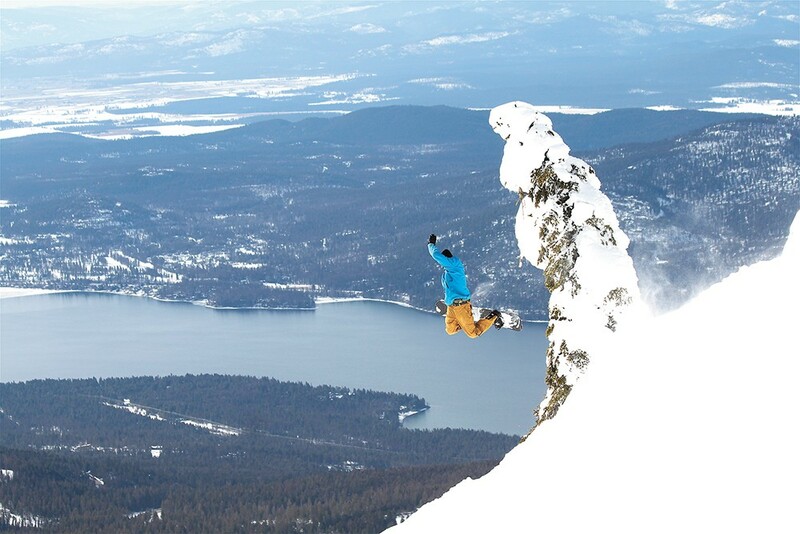 Brundage Mountain, home to "The Best Snow in Idaho," is located in the high mountains of central Idaho, near the charming lake town of McCall. This hidden gem offers 1,500 acres of skiable terrain, with another 19,000 acres available through their backcountry cat-skiing operation. The mountain is blessed with 320 inches of average annual across, powder-packed glades and spacious, wide-open groomers. Many lodging options are available in nearby McCall, with shuttle to the mountain. Crystal Mountain Resort, which feels like a million miles away from the hustle and bustle of Seattle, is an easy two-hour drive from the big city. Located in the shadows of Mt. Rainier, Crystal offers 2,600 acres of skiable terrain — 2,300 of which are lift-served — with a little bit of everything for all abilities: steeps, groomers, bumps, glades and chutes await skiers and boarders. In the village, there are several lodging options and a full array of dining and après-ski libation options. Affectionately known as "Disco," it's the epitome of the many mom-and-pop types of operations scattered throughout Montana. Discovery Ski Area is located off the beaten path, near the towns of Anaconda, Georgetown and Phillipsburg. The ski area offers 2,200 skiable acres of terrain, with a perfect blend of challenging steeps and gently groomed cruisers. Amenities are available on the mountain for your day-to-day needs, with lodging available in the nearby towns. A visit to Fairmont in southeastern British Columbia is a visit to an adventure-filled "all-inclusive spa," but adding downhill and Nordic skiing, snowshoeing and tubing. The bonus for skiers: every lift ticket comes with access to the oversized hot springs. There are multiple lodging options at this quaint, family-friendly resort. When it comes to best ski towns in North America, there's a reason why Fernie Alpine Resort always ranks among the top. The resort offers plenty of terrain, with 2,500 acres, five alpine bowls that offer something for every level of skier, and a visually dramatic backdrop. The resort shares its name as the town, where it's common to see skiers and boarders walking around with their gear on, either going to or coming from an epic day on the slopes. The epicness continues into the après-ski scene in the village and town, littered with art galleries, ski bars and a funky, cool scene that's uniquely Fernie. With a huge vertical drop, more than 20 feet of average annual snowfall, 2,800 skiable acres and what seems like an infinite number of chutes to keep advanced and expert skiers and boarders busy for days, a trip to Kicking Horse will not disappoint. The resort offers stunning views, featuring the sheer ruggedness of the surrounding mountains. Amenities are as grand as the terrain, with many lodging options available in the village, as well multiple eating and drinking establishments. Other resort activities include snowmobiling, ice skating and tubing. 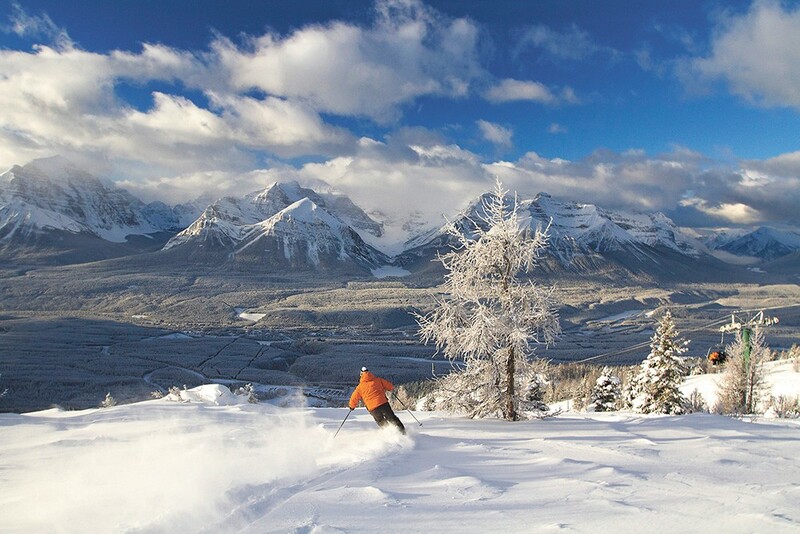 Looking for a genuine Canadian ski vacation? Then look no farther than Kimberley Alpine Resort, located under blue skies in the Purcell Mountains. Sunny days, perfect champagne powder, and 1,800 acres of terrain for all abilities, with a cute, Bavarian-themed town right at the base of the mountain, makes this the perfect getaway for the entire family. Kimberley offers a huge variety of accommodations, as well as activities that the entire family can enjoy outside of skiing. Lake Louise Ski Resort is the biggest resort in the Canadian Rockies, with an incredible amount of terrain for every ability level. 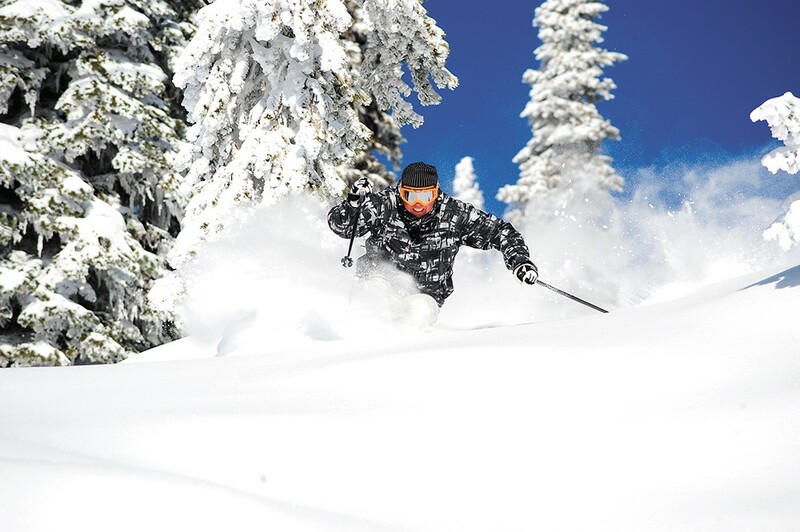 The resort offers 4,200 skiable acres and what feels like an infinite amount of vertical. The longest run checks in at 5 miles. Ten lifts get skiers and boarders to their favorite destinations. And there are plenty of options for lodging in Lake Louise, as well as in nearby Banff. In the midst of an expansion that will double the total skiable acres and add 500 vertical feet, Lookout Pass remains the most genuine, family-friendly resort in the Inland Northwest. Currently, there are 540 acres of terrain, with a nice mix of steeps, glades and groomers. The area receives an abundance of snow — almost 400 inches on average annually — and is conveniently located right off Interstate 90 on the Idaho/Montana border. At the base is an historic ski lodge with a lively atmosphere. Mount Bachelor is 22 miles from the funky city of Bend, Oregon. This is the type of ski area that makes for unexpectedly epic days. Located at the top of the Continental Divide, tucked away in the Bitterroot Mountains, 90 miles south of Missoula on Highway 93, this hidden gem offers 1,800 acres of pure goodness. An average of 325 inches of snow falls annually, over a mix of terrain that's fun and challenging at the same time. Lost Trail has a locals-only type of feel, with a welcoming vibe. Located in the heart of the beautiful north-central Cascade Mountains, Loup Loup Ski Bowl is Washington's prime mom-and-pop ski area. There are 300 acres to explore for downhill ski and snowboard enthusiasts, with another 23 kilometers of Nordic trails available. The area is operated by a nonprofit foundation with a goal of promoting outdoor recreation through education and community. Sometimes overlooked in favor of bigger resorts to the west, Mission Ridge is perched on the sunny side of the Cascades near Wenatchee. The terrain seems mostly unassuming, though it offers some exciting chutes, glades and steeps, which are true hidden stashes. The mountain offers 2,000 acres of skiable terrain and has some fun, wide-open cruisers to enjoy on your way back to those hidden treasures. Atop the mountain, there are sweeping views of volcanoes among the Cascades, sunny skies, and some of the best powder the region has to offer. Lodging options are plentiful in Wenatchee, only 12 miles down the mountain road. Located an easy 22 miles from the cool, funky city of Bend, Mount Bachelor boasts one of the Pacific Northwest's longest ski seasons, usually starting in November and lasting well into May. The resort boasts one of the highest summit elevations in the Northwest, 4,318 acres of varied terrain, and a massive average annual snowfall of 462 inches. Plenty of amenities are available in Bend, as well as nearby Sunriver Resort. When it snows in the Pacific Northwest, it seems to dump at Mt. Baker Ski Area. The area has a cult following due to the amazing amount of average annual snowfall — approximately 650 inches. The ski area is located in the Mt. Baker-Snoqualmie National Forest, in the shadows of one of the Northwest's many volcanoes and the ski area's namesake, Mt. Baker. The terrain is visually intimidating, with steeps and craggy terrain scattered throughout the mountain. Looking for great prices, minimal lift lines, a family-friendly atmosphere, amazing powder and breathtaking views? A trip to Baldy Mountain Resort should be on your list. Located in southern British Columbia, overlooking the Okanagan Valley, the resort offers plenty of sunshine, tree skiing and untracked powder. Combine your skiing adventure with a visit to one of the many area wineries for a unique experience. The variety of terrain offered at Mount Hood Meadows is what makes the ski area so unique and popular. Located on the sunny and wind-protected side of one of Oregon's most iconic mountains, the area receives an abundance of snow — an average of 430 inches annually — and offers some of the most spectacular skiing and snowboarding in the Northwest, with 2,150 acres of playful and challenging terrain. And it's all about 90 minutes from Portland. A trip to Mount Hood Ski Bowl is built around the entire family. In addition to the large number of acres available for skiing and snowboarding, including one of the largest night skiing operations in the country, the ski area offers numerous activities outside of skiing to keep the family members of all ages entertained. Activities include day and nighttime Cosmic Tubing and Frosty's Playland. There are several dining options at the ski resort, with many lodging options available nearby. Located only four miles from the village of Banff, Mount Norquay sits above beautiful Banff National Park. The ski area consists of 190 quaint acres, with a high summit elevation of 8,040 feet. They also have snowmaking capacity on more than 85 percent of their terrain, helping ensure great coverage during their open season. Just a hop, skip and a jump from the bustle of downtown Spokane — 28 miles away — this ski area shares its name with the state park it's located in the heart of. The ski area has 1,425 acres of skiable terrain, with a large amount of it open for night skiing four evenings per week. They also offer a developed terrain park with many features that are meticulously maintained. Conveniently located only 45 miles from Calgary, Nakiska was home to the alpine events during the 1988 Winter Olympics. The area offers a great escape from big-city vibes with pristine, wide-open groomers offered across 1,021 skiable acres. World-class dining, lodging and spas are located nearby in Kananaskis Village. Panorama Mountain Resort offers the perfect amount of adventure and solace. There are those who go there to get away from it all, and those who visit because everything is there. The resort has one of North America's top verticals, 2,847 acres of terrain that has everything from groomers, glades and steeps to the Taynton Bowl, offering 700 acres of all black-diamond runs. Back in the well-equipped village are world-class hot pools to relax in after a big day on the mountain. Montana's Whitefish is known among locals as "The Big." A visit to Phoenix is a like a step back into the early days of Canadian ski history. The ski area, located just over the U.S. border in south-central British Columbia, is off the beaten path for adventure seekers wanting to get away from the crowds. The mountain offers a "locals only" feel, with plenty of fresh powder and expansive views of the southern Monashee Mountains. There are 18 runs, all accessible by the T-bar, which provides terrain for all skill levels ranging from beginner to advanced. Red Mountain, located just over the U.S. border, offers an unspoiled 4,200 acres of pristine skiing, 2,877 of which are lift-assisted. 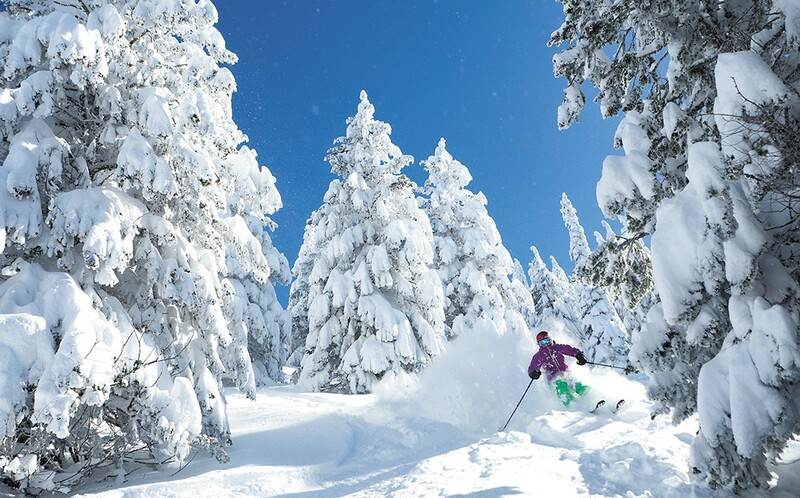 The resort, located near the town of Rossland, is best described as steep and deep, with four peaks to explore, 300 inches of average annual snowfall, and a ridiculous amount of vertical terrain. Between the village and the town, there are multiple lodging options available. Revelstoke Mountain Resort, located on Mt. Mackenzie in the Selkirk Mountains of British Columbia, offers 3,121 acres of skiable terrain and boasts true fall-line skiing. In addition to the massive vertical drop, the terrain features multiple high alpine bowls, renowned glades and endless groomers. The resort also boasts a truly unique experience, with cat-skiing, heli-skiing and lift-assisted skiing all available from one base area. Revelstoke also brings the intensity down a notch with activities for the entire family in the Turtle Creek Tube Park, and has a beginner area right in the center of the village. Schweitzer Mountain Resort, perched high above beautiful Lake Pend Oreille, offers scenic views, destination amenities and terrain that will challenge any ability. With 2,900 skiable acres over two massive bowls, there are plenty of secret stashes to find, glades to explore and groomers to rip. A visit to the Sky House lodge at the mountain's summit is not to be missed, with a full restaurant to enjoy the views while warming up between runs. The village offers lodging, dining and après-ski options, with more choices available nine miles down the road in Sandpoint. An epic, 3-mile long gondola ride awaits at Silver Mountain. A unique family adventure awaits you at Silver Mountain Resort, located conveniently off of Interstate 90 in Kellogg, where ease of mind starts upon arrival. Parking, lodging and amenities all happen within minutes of getting off the freeway. Grab a coffee, load the gondola and enjoy the three-mile ride. Upon arriving at the mountaintop village, you'll be greeted by 1,600 acres of skiable acres across two mountain peaks. There's a variety of terrain, with glades, groomers and steeps to keep you entertained and challenged. A hidden little gem in a haven of champagne powder, Silver Star — the third-largest ski resort in British Columbia — offers four distinct mountain faces over 3,282 acres of varied terrain, including 1,900 acres of black and double-black diamond runs on the backside. Don't be alarmed; there's plenty of terrain for all abilities. A visit to the vibrant mid-mountain village offers the truest of ski-in, ski-out access. Under the sunny skies of the north-central Cascades is historic Sitzmark, offering sunshine, powder snow, great views and the cutest little ski area, with 80 acres of terrain to explore. It's an easy 20 minutes from the town of Tonasket. Snoqualmie Pass, the most accessible ski area to Seattle, is located 54 miles east on Interstate 90. This skiing metropolis consists of four unique areas, all offering something a little different for skiers and boarders looking for easy and quick access to the mountains. The four areas total 1,981 acres of skiable terrain. In addition to amazing terrain parks at Summit Central, the steeps of Alpental and extensive night skiing at Summit West, the Pass also offers Nordic skiing and tubing adventures. A ski area as funky as the town at its base, Snowbowl is just 12 miles above the eclectic and earthy city of Missoula in the Lolo National Forest. The terrain is known for being exciting and challenging, with a mix of steeps, glades and wide-open cruisers. Slopeside lodging is available at the Gelandesprung Lodge, a European-themed hotel; stay and splurge on some of its great food and beverage options. For a more diverse cultural experience, include a stay in Missoula and take advantage of numerous unique dining options, the live music scene and many lodging options available within any budget. It's no wonder why the stoke level is always so high at Stevens Pass, as epic conditions are a regular occurrence. With an average of 460 inches of snow that falls annually over a diverse mix of terrain, from steeps to playful groomers, add the lively atmosphere from arrival to departure; Stevens will not disappoint. Night skiing is available five nights per week, with several lifts lit up for night operations. Stevens is accessible from either the west or east side on Highway 2: 90 miles from Seattle to the west, 35 miles from Leavenworth to the east. 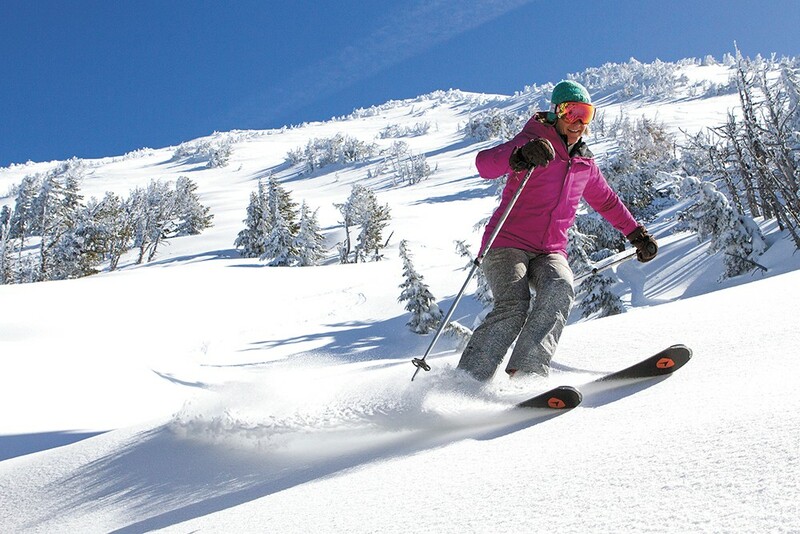 A visit Sun Valley is definitely worth a trip to experience a tour through skiing history. The town of Ketchum divides the two very distinct faces of the resort. At Baldy, you'll find perfect-pitched vertical from the peak to the base. There are no flats; it's all vertical. The lift infrastructure ensures nearly nonexistent zero lift lines, and the terrain ranges from expert to beginner, immaculate groomed runs to open bowls. Dollar Mountain, the learning ski hill for the area, is home to the very first chairlift. In addition, Dollar includes rails, a superpipe and a terrain-based learning environment. Accommodations and mountaintop and village lodges are world-class, down to the smallest details. Sunshine Village, about a 15-minute drive from the majestic mountain town of Banff, offers three sprawling mountains to explore with 3,300 acres to play on. In addition to being able to ski in two provinces — Alberta and British Columbia — the mountain offers a large amount of snowfall, cold temperatures and high altitude, giving Sunshine great coverage, a long season and epic conditions. The resort has the longest non-glacial ski season in Canada, typically operating from early November through late May. Tamarack Resort, overlooking Lake Cascade in Idaho's beautiful west-central mountains, 90 miles north of Boise, offers a blend of mountain resort, majestic meadows and lakeside activities. The resort features 1,000 acres of lift-accessible terrain, with glades, steeps, cornices and impeccable groomers. In the village, there are multiple lodging and dining options, making Tamarack a perfect family adventure. Timberline is a mecca for the snow lover who wants year-round skiing opportunities. Towering above the resort is Mt. Hood; at the base is the historic Timberline Lodge, an icon for the ski industry. The resort operates all 12 months, snow permitting. During the winter months, the area has 1,415 acres to explore. Lodging is available at Timberline, or just six miles away in Government Camp. If you're looking for a mountain that's all vertical from the top of the lift to the bottom, a trip to Turner Mountain, outside of Libby in northeastern Montana, is a must. With a little over 2,100 vertical feet of some of the best fall-line skiing, Turner is also very user-friendly, with one chairlift that funnels all runs back to the base area. Another of the state's many great mom-and-pop ski areas, Turner takes it one step further and rents the mountain for private functions on the days that they're not open. Whistler and Blackcomb can only be described as massive, consisting of two side-by-side mountains that when combined have a total of 8,171 acres, with 16 bowls, 200 runs and three glaciers to explore. The description 'massive' doesn't stop at the skiing and snowboarding; Whistler Village boasts more than 200 retail shops and restaurants, with a wide range of nightlife choices and seemingly endless options for family activities, on and off the snow. Located on Highway 12, about an hour away from Yakima, White Pass is a great getaway from the city, with a relaxed, family-friendly atmosphere. The terrain ranges from rolling groomers to challenging steep glades. White Pass also has 18 kilometers of track-set trails in their Nordic system. Slopeside lodging and all of the other amenities are available right in the village. Affectionately known by the locals as "The Big," Whitefish Mountain Resort more than earns that nickname. The resort offers 3,000 acres of skiable terrain, 360-degree views of the surrounding mountains, Whitefish Lake and Glacier National Park, and plenty of options when it comes to food and beverage amenities, as well as lodging. Stay in the village with numerous lodging options, lively bars and pubs, and great restaurants, or in town to experience the local flair.